Yesterday was marked 15 years since the March pogrom of the Serbian people from Kosovo and Metohija. Conflicts occured on March 17, 2004, after Unmik police found the bodies of two Albanian boys in the Ibar River in the village of Čabar near Zubin Potok, in the north of Kosovo, and the Albanians blamed Serbs for their death and retaliated. Over 4,000 Serbs were driven out from their homes, in 6 towns and 10 villages was conducted classic ethnic cleansing, and 19 people were killed! 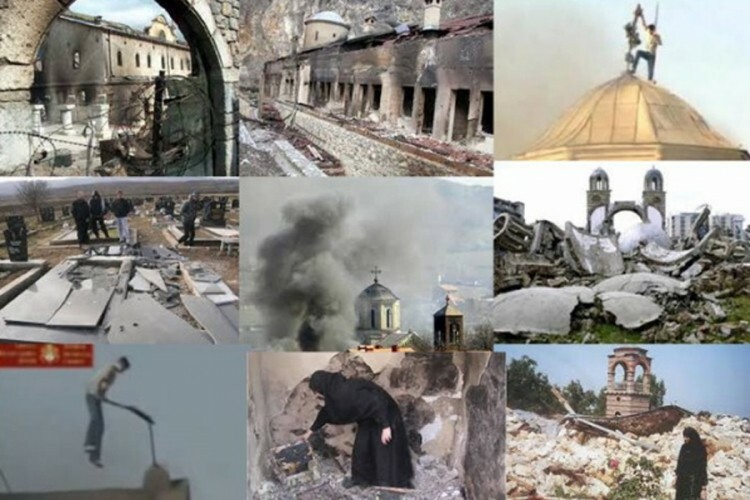 900 homes, as well as 35 Orthodox churches and monasteries, including 18 monuments of culture, were destroyed or damaged. The monastery Devic near Skenderaj and the monuments of the Holy Archangels near Prizren were demolished to the foundations. In Prizren, the Church of the Holy Virgin of Ljeviska from the 14th century was burnt, which was later placed on the list of monuments under the protection of Uneska, and the Church of St George from the 16th century, on which the threatening message “Death to the Serbs” was written. 10 Serbian schools, health centers, post offices and other facilities of the state of Serbia were destroyed or burned. Let us remember all the innocent victims of the March pogrom in Kosovo and Metohija! They must not be forgotten!